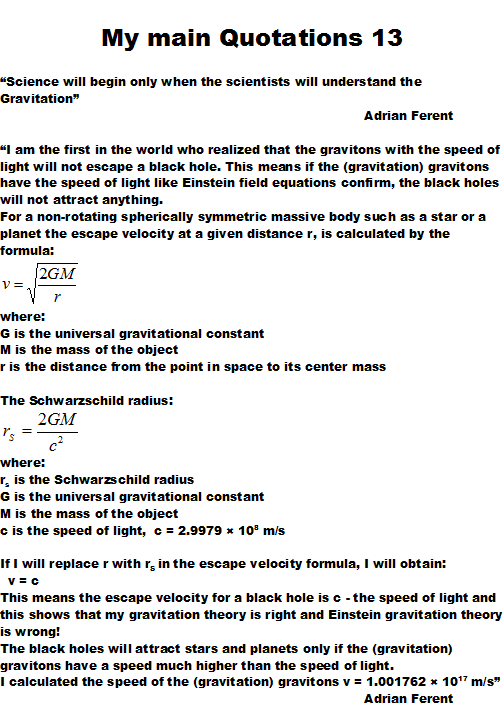 ANOTHER PROOF FOR MY THEORY: Ferent Gravitation theory is right and Einstein General Relativity is wrong! “I am the first in the world who realized that the gravitons with the speed of light will not escape a black hole. This means if the (gravitation) gravitons have the speed of light like Einstein field equations confirm, the black holes will not attract anything. 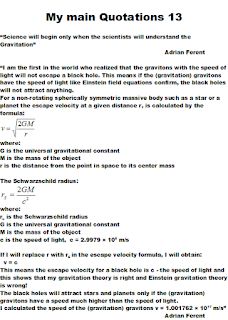 The escape velocity for a black hole is c - the speed of light and this shows that my gravitation theory is right and Einstein gravitation theory is wrong! The black holes will attract stars and planets only if the (gravitation) gravitons have a speed much higher than the speed of light.